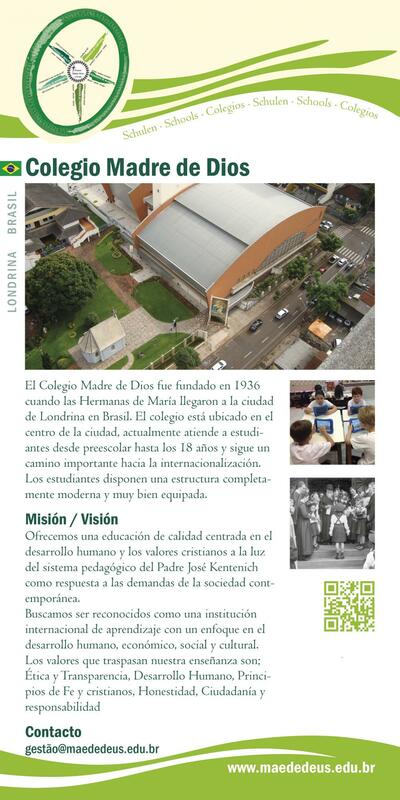 The school was founded in 1936 shortly after the Sisters of Mary arrived in the city of Londrina, Brazil, and has been run by them since then. The school is situated in the city centre and is composed of an elementary, primary and secondary school (children until 18). For years the school has been becoming international in character. The students are offered a modern infrastructure and good equipment. We offer high-quality education with special emphasis on hu- man development and Christian values against the background of Fr Kentenich‘s pedagogy, as an answer to the demands of society today. We are striving to become known as an international institu- tion that particularly values the development of soft skills in its education. The values we want to pass on in the lessons are therefore, in particular: ethics and transparency, the princip- les of Christian faith, honesty, awareness of civic duties and responsibility.